A captivating original circa 1882 lady's rich deep mocha silk satin two piece bustle gown that is accented with complimenting silk brocade panels. Wonderful detail, impeccably tailored, with a ruched front panel, a bunted bustle, and a two tier pleated hem. A front button closure of paint decorated glass buttons, with a flirty accent bow at the tail. A lined and stayed bodice, with a brown cotton lining to the skirt. 15" from shoulder to shoulder, a 34" bust, 24" waist, and 55" from shoulder to front hem. In very good clean sound condition, with some light perspiration to the armscyes, one partial button, a few very tiny age flaws, some minor color variation to the skirt, and a hardly noticeable spot at the hem point of the bodice that must be looked for. 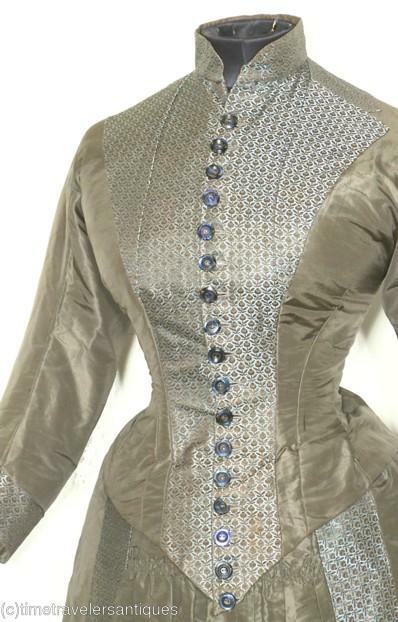 Quite a heavenly Victorian era bustle gown.